OnTime can help you to simplify and speed the complex and time consuming process of managing your employees with our automated time tracking and compensation report generation. Your employees will view, use, and be tracked by OnTime exactly how you choose. You are in control of how OnTime works with your delivery company. Each employee that uses your OnTime account can be assigned a role (Manager/Administrator, Dispatcher/CSR, or Driver), user name, and password. The role determines which programs the employee will have access to, which they will login to using the user name and password. 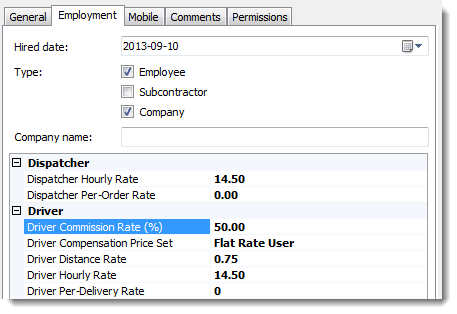 The Employment tab for each user offers the ability to input the employee’s hired date, employment type (Employee, Subcontractor, or Company), company name, and various rates. Rates determine how the employee is compensated for their time based on role, assignments, commission, and so on. 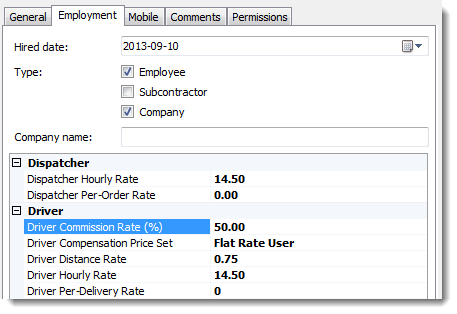 Price sets can be used to create custom compensation rates beyond the built-in options. Once setup, users can clock in and out of the system manually or automatically from their assigned programs, determined by the set roles. OnTime will keep track of time worked and activities completed for each individual. You can click View Time and Activity Report on the left of the User section to view reports about the selected user. Alternately, you may right-click on a user to view time sheets, time sessions, or more report options. Employee management is in your control with OnTime. We can help you to better track your employees’ time and ensure that compensation is correct for each individual. Contact us or buy OnTime now to try this feature for yourself. OnTime 360's Management Suite and Dispatch applications include our powerful Tracking view, which offers a variety of features that help to streamline and automate courier business-related tasks. As an OnTime user, you can our tools, such as the Advanced Search and Quick Views, to customize the Tracking view to display information in the best way for you. 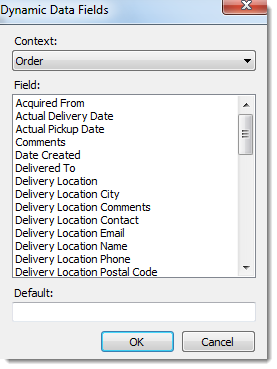 With our Advanced Search feature, you can filter your Tracking view by any field on a shipment. Those advanced searches can then be saved as a pre-set view, or a Quick View. 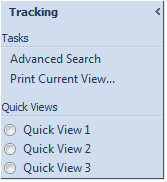 From the Tracking View, you can later select those Quick Views and OnTime will display search results based on your saved preferences. With Quick Views, you can tailor OnTime’s already efficient Tracking view to work quicker and better for each manager and dispatcher in your company. As information is added into OnTime by you or other users, the saved Quick Views will update automatically. The most up-to-date, relevant information will be displayed, based on your customized searches. The comprehensive criteria available in OnTime’s advanced search will allow you to utilize your Quick Views to organize and help perform time-consuming tasks within your delivery business. 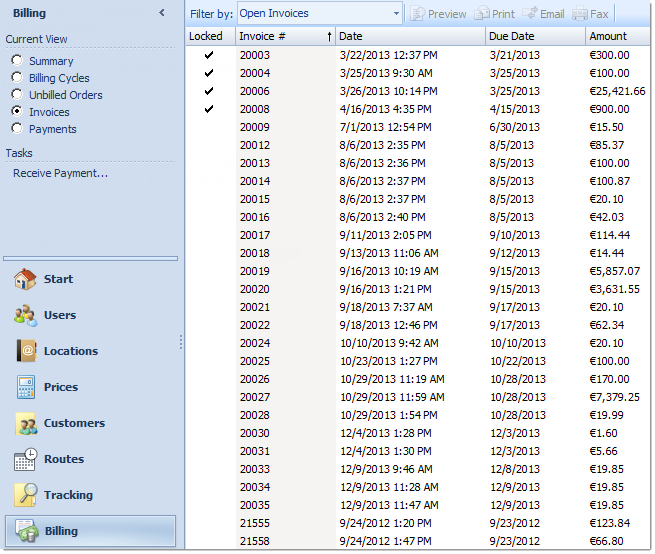 For example, you can save a customer-specific Quick View and export the data as an Excel or CSV file. Reporting for that customer will then be simplified. OnTime 360’s Quick Views feature will help your company avoid day-to-day tedium and improve overall efficiency. This feature is included with every OnTime subscription level, which means that your company can enjoy these benefits today starting at $9.95/month. 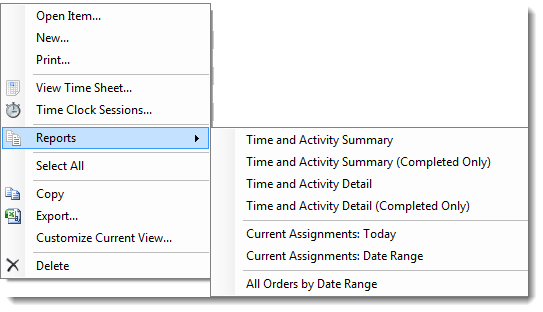 OnTime 360 subscriptions offer a unique array of customizable features, such as an included set of User Defined Fields. 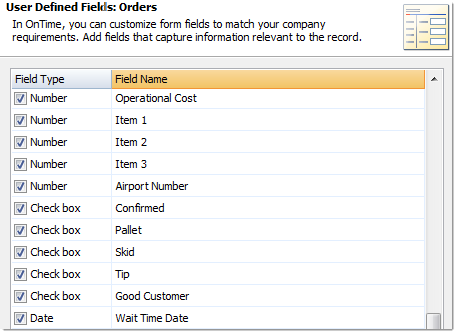 With our User Defined Fields, you can input custom information about orders that will appear to all of your customers and users across OnTime. Each field can be named and used in the way that you desire. 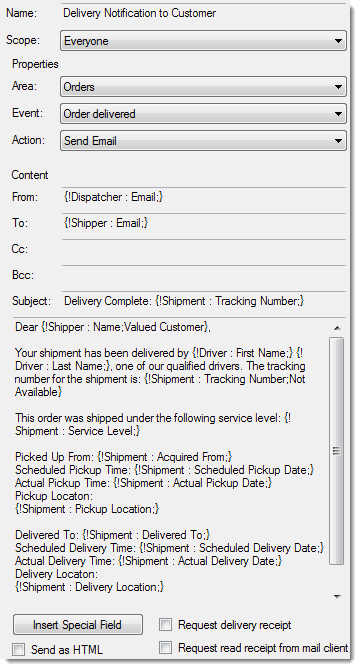 While most courier software systems offer between zero and ten User Defined Fields, each OnTime subscription includes the ability to define up to 50 Custom Fields. The fields can hold four types of data: alphanumeric strings, numbers, dates, or Boolean values (true/false). OnTime's Custom Fields offer the flexibility to preserve the data that you truly need, at any moment. These fields are not only available through the OnTime applications. 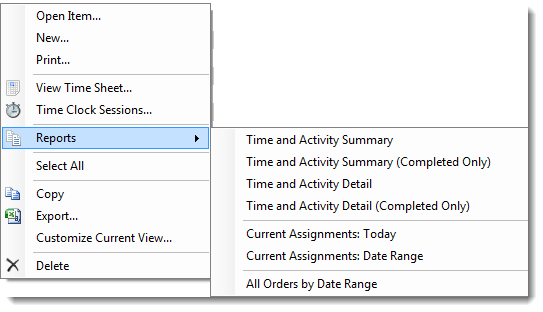 In a recent update, we have integrated Custom Fields with our API, allowing you to make other software post information to or from your OnTime User Defined Fields. OnTime is the only courier software that offers API calls for Custom User Defined Fields. 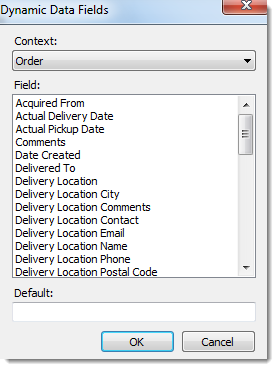 Using OnTime's Custom Fields will allow our software to work even better with your delivery business. Our services scale with you, future-proofing your company and freeing you from software limitations. 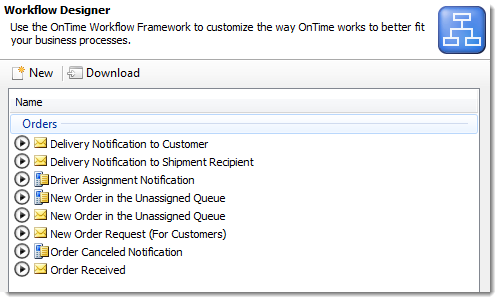 No other delivery software is as customizable as OnTime 360. Learn more about the OnTime API or download OnTime now. In July of 2013, OnTime 360 became the first delivery management software of its kind and caliber available in a pure 64-bit version. At OnTime, we are always working to keep our services and clients up-to-date with the best available technologies. Of course, we also work to make our services available to our clients using their existing equipment, so OnTime is still available and fully functional in a 32-bit version. We are the only courier software with a pure 64-bit connection to QuickBooks, which allows for more data to be sent faster between QuickBooks and OnTime applications. Data can be sent faster between Excel and OnTime, as well. Multitasking is vastly improved with 64-bit processors. Multiple programs may be run and switched between quickly and seamlessly, allowing you to simultaneously use OnTime Management Suite, OnTime Dispatch, QuickBooks, Excel, and whatever other programs you need, without issue. Your move to the 64-bit version will be seamless. Our installer will auto-detect and choose the optimal version for your computer, so that you don’t need to select between 64-bit or 32-bit. All 64-bit improvements will automatically become available if your computer runs the 64-bit version. Try, Buy, or Download OnTime 360 to see the 64-bit version for yourself. People are often curious about OnTime’s international capabilities. With our subscribers spread across six continents, we’ve implemented a number of automatic functions within OnTime to ensure that the system always works for every region. OnTime 360 smart delivery management software is available across the globe, and our integrated Unicode support allows any language to be entered into the system. Although OnTime’s UI will appear in English, you may use any language to input information. 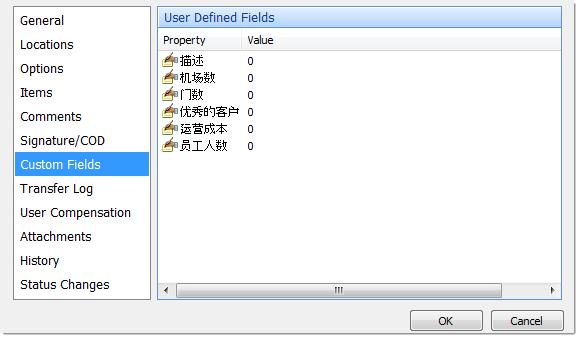 From Customer Names and Notes to User Defined Fields, all of that information will be displayed in the entered language, even if the text uses non-Latin based characters or runs left-to-right. OnTime is considered the smart courier software because it automatically works with delivery businesses. One way the system does that is by detecting and using the regional settings found in Windows, then displaying date and time formats accordingly. OnTime’s applications will automatically adjust date and time settings based on local settings, so if you create an invoice on a computer that uses a 12-hour clock, but print that invoice on a computer that uses a 24-hour clock, the printed invoice will use the 24-hour clock. In other courier management programs, if you enter information at 12:00 PM Eastern Time, that information will be time stamped as 12:00 PM, even in other time zones. OnTime 360 addresses time zones differently, allowing you to offer your customers a more personal experience. Our applications each render everything locally for the viewer, based on their regional settings in Windows. For example, when your employees in Eastern Time see a 12:00PM time stamp, OnTime will automatically show 9:00AM to your customers who use Pacific Time. Again, OnTime intelligently detects and uses your local Windows regional settings to display the appropriate currency for your business. OnTime supports all major currencies. We recommend consistency with the currency-type that you use across your OnTime account. OnTime supports the use of any unit of length. As with currency, we recommend that you are consistent with whatever unit you choose. When we introduced our free website applet that allows shippers to track their orders from your website, we promised that we had similar additions planned. We are pleased to announce OnTime's second free applet that can be used on any web page. The new applet allows your website visitors to enter two postal or zip codes and receive an automatic cost estimate for shipping with your company. The Price Estimate applet is available to every OnTime user, with any subscription plan. Select the price set and type of pricing you want to use. You may also include a disclaimer that customers see with the price. 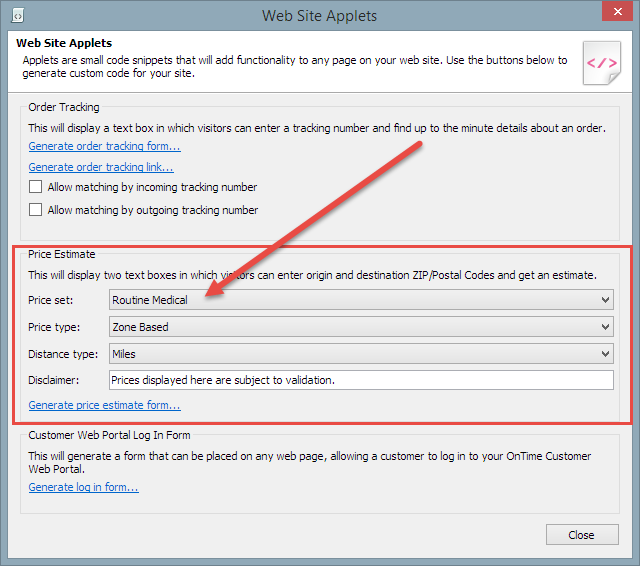 To generate the code for your website, click on the link labeled Generate price estimate form. Paste the code where you would like the price estimate applet to appear on your website. If you have any questions about this tool, feel free to contact technical support. OnTime offers flexible pricing capabilities across the system. 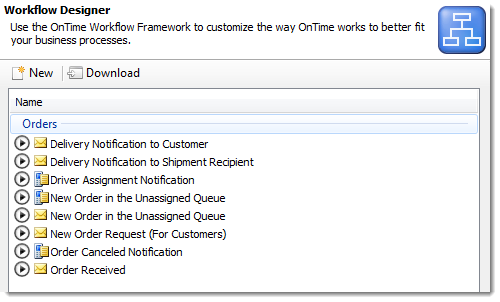 Starting in release 2.4.133, more powerful features have been implemented to further improve OnTime’s already capable pricing architecture. Often, users of OnTime need to calculate a percentage of an order to determine charges, such as fuel surcharges and taxes. OnTime has always allowed these percentages to be determined in relation to the order’s base price; however, some users have requested more flexibility. OnTime accommodates this need by allowing one or more price modifiers to be chosen to make up the base price that the percentage will be calculated from. 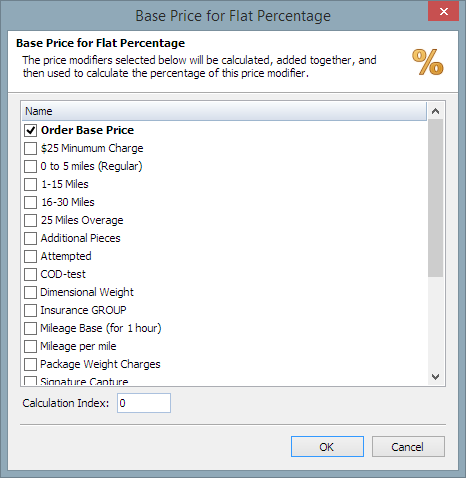 Create price modifiers as necessary to describe the percentage charges. Set the modifiers Action type to Flat Percentage. 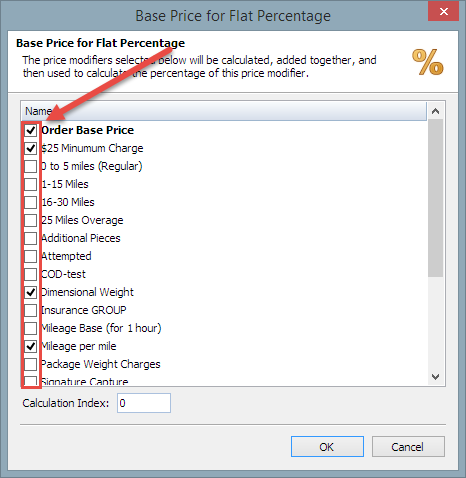 Click the Set % button to display a list of all price modifiers that are included in the price set. Place a checkmark next to each entry that you would like to be included in the total from which the percentage of this price modifier will be derived. Click OK to save these settings and then save the price set. OnTime can work with Blackberry devices to transmit GPS locations. Because OnTime Mobile Web operates primarily through web browsers, some configuration may be necessary to ensure that a Blackberry successfully transmits location information. Open the browser's main menu. Choose Options > General Properties. Log in to the OnTime Mobile Web application in the browser and you will be prompted with a message box asking permission. Check the box labeled Remember my decision for this site and then click the Allow button. OnTime will automatically transmit the device’s current location once every 60 seconds. Adjust the power settings to prevent the device from turning off automatically. Load a third party application to control the prevention of certain applications turning off. Leave It On is an example of an app that may help. OnTime offers a convenient way of managing documents and other files. 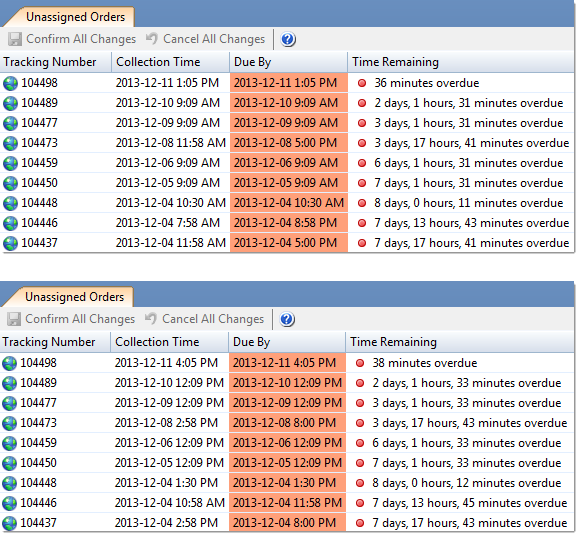 Your customers can access these files via the OnTime Customer Web Portal. Each file is limited to 100 KB in size. A PDF scanned in black-and-white (not grayscale) will be around 50 to 80 KB. 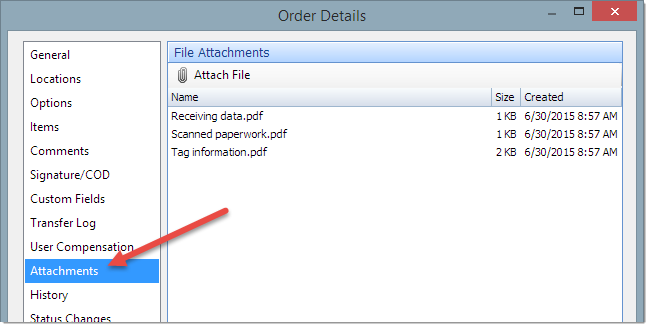 Customers can click on files to download and view.